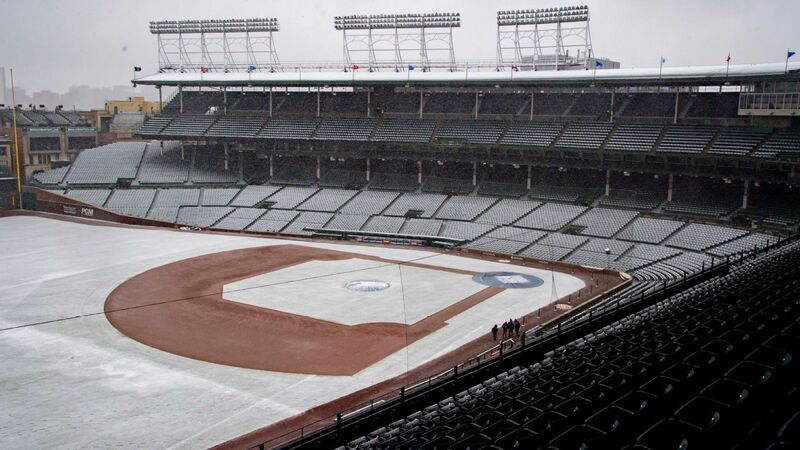 Snow postponed Sunday’s game at Wrigley Field between the Cubs and the visiting Los Angeles Angels. CHICAGO — Snow and rain led to the postponement of Sunday’s finale of a three-game series between the Los Angeles Angels and Chicago Cubs at Wrigley Field. A steady snow fell throughout the morning and a mix of snow and rain continued throughout the afternoon. With the postponement, the Cubs decided to keep Tyler Chatwood in the bullpen for now and start Yu Darvish in the opener Monday of a three-game series in Miami. Chatwood had been scheduled to take Jon Lester‘s turn in the rotation after the left-hander strained his left hamstring. Right-hander Trevor Cahill will start for the Angels in the opener of a three-game series at Texas on Monday night.